phase (consuming disk space and time). 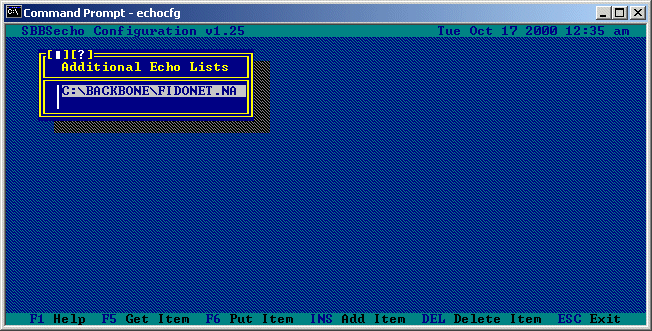 or any echomail programs after you have installed SBBSecho. mail packets, mail sessions, node lists, etc. Zones, Nets, Nodes, and Points? components (four to be exact). The components are: zone, net, node, and point. is the only required element of an FTN node address. which indicates the system is not a point node address. net and node numbers (i.e. 103/705). net, node, and optional point numbers (i.e. 1:103/705.1). 3D or 4D address with an appended "@domain" (i.e. 1:103/705@fidonet.org). style mailer, you are using what we will refer to as a "FLO Mailer". Both types are supported equally by SBBSecho. Point-to-point (usually person-to-person) direct or routed messages. distributed on a regional or continental (e.g. FidoNet Zone 1 backbone) scale. distinguish each area from the others. uncompressed file. Packets may contain echomail and/or netmail messages. continue packing them and sending them on their way. inbound bundles to .MO_, .MO-, or .MO. SBBSECHO.DOC file into your Synchronet DOCS directory (usually C:\SBBS\DOCS). improved performance, you will want to run one of the 32-bit versions. Add the SBBSCTRL and SBBSNODE environment variables to your AUTOEXEC.BAT. important, use your NODE1 directory. and modify it so that it reflects the proper drive letters and directories. at least export their native area file to this format - i.e. GEcho's GSETUP). 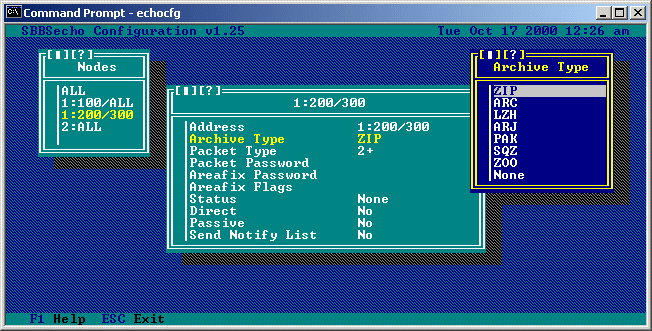 you imported an AREAS.BBS or FIDONET.NA file into SCFG to begin with). Lines beginning with a semicolon (;) are considered comments, and are ignored. 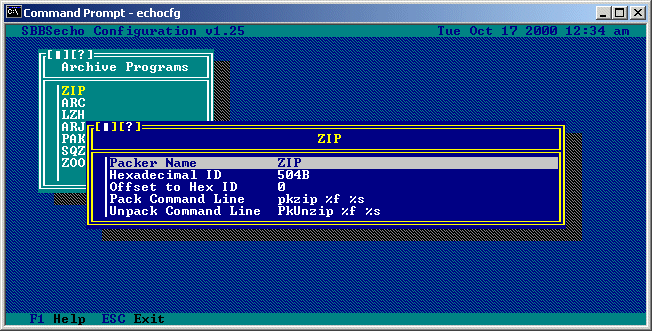 codes are considered "Passthru" (not imported to your BBS). 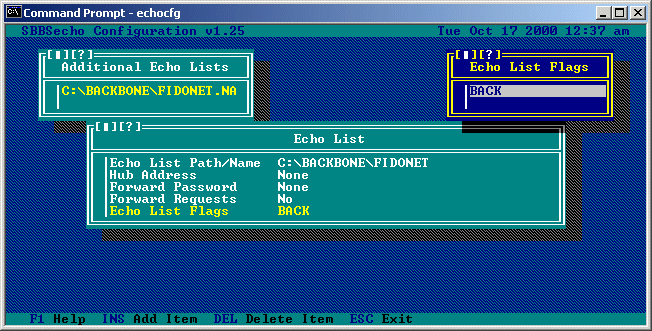 TAG 	is the FidoNet tag as shown in your echo list (i.e. FIDONET.NA). line can be up to 1000 characters in length. It must be changed to match the example given above! 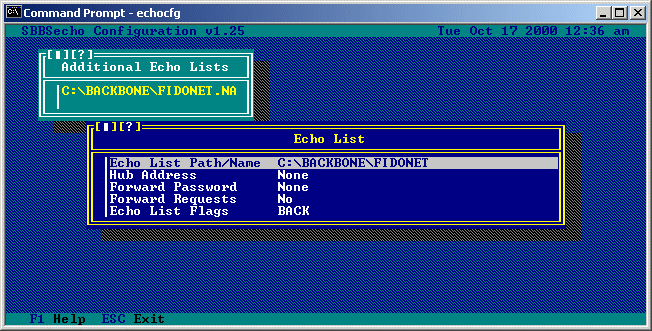 ECHOCFG from any drive and directory on your system. 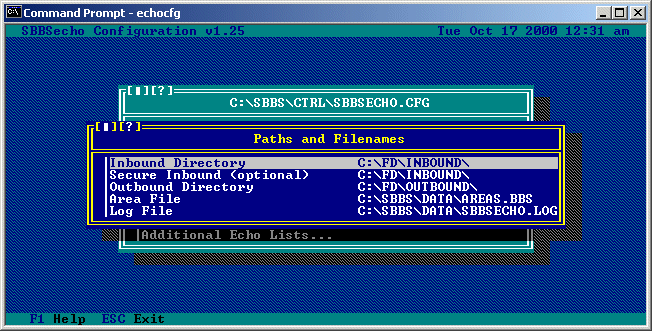 SBBSECHO.CFG located in your Synchronet CTRL directory. allows you to specify the maximum size of each outgoing mail bundle. the like. Setting this to 0 will disable this option. when SBBSecho sends out an areafix message or a file attach. via an area manager request. when using that command line option in SBBSecho. set in the SCFG program. 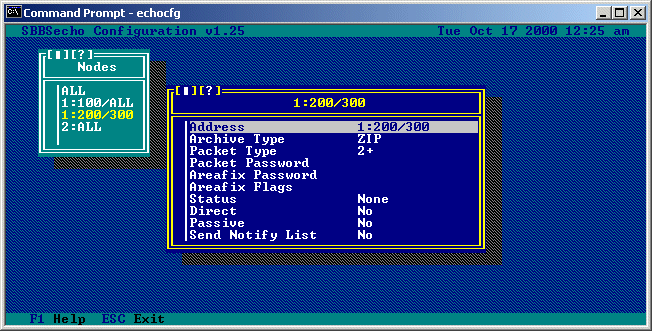 the file AREAS.BBS in the data directory defined in SCFG. 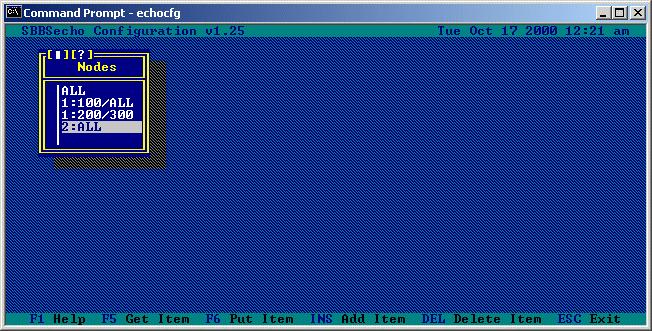 SBBSECHO.LOG in the data directory defined in SCFG. 'Yes', 'No', or to their default states, respectively. These options allow you to toggle various features in SBBSecho. failing this security will not be imported. giving the executable programs more free memory to run in. This option is only used in the 16-bit DOS flavor of SBBSecho. from incoming echomail in the Synchronet message base headers. This option is useful for troubleshooting problems. (via area manager) which are listed in the AREAS.BBS list. This option allows you to add or remove archive programs from SBBSecho. when determining the compression type used on incoming bundles. hexadecimal value for the letter 'K'. the hexadecimal ID for this archive program can be located. specifier will expand to the name of the file being compressed. to allow other nodes to add areas via area manager requests. conferences in this list (i.e. : from Planet Connect). for each node from the 'Nodes...' sub-menu. may add and remove flags for this echo list. some command line switches have been eliminated. Remove all references to SBBSFIDO from your batch files (if you have any). See the included MAILER.BAT as an example. in one grouping (multiple /switch sets are supported, but not required). turn echo areas off and on, list currently connected areas, and more. Address all requests to 'SBBSecho' or 'AreaFix' (without quotes). Your Area Manager password goes on the subject line. NOTE: A compression type of NONE is also supported for uncompressed packets.